Because beaches and dunes change very slowly, humans do not notice what is happening. Because they also poorly understand how dunes and beaches behave, they often do the wrong things. Here you can learn how to detect if a beach is healthy or sick, what causes it and what you can do about it. But not all beaches can be saved. Learn to recognise the symptoms of a sick beach. Every beach is different, has different threats, a different history and needs to be treated differently. Almost all the threats to our beaches come from human activities, often far away from the beach. We somehow need to change our ways and behaviour. Not all beaches can be saved but it is important to recognise which can. Using local examples, seemingly outrageous suggestions are made. A review of some beaches in northern New Zealand, that are worth saving. The examples may illuminate general considerations. As we have set out extensively before, the health of a dune/beach system has little to do with the amount of sand either in the sea or on the land. So one does not need to spend decades of laborious monitoring of the sand budget in order to qualify the health of a given beach. (In fact sand mass monitoring does not say anything about beach health at all). But some knowledge of a beach's history could serve to advantage, much like a physician takes clues from a patient's history. Just like patients, no beach is alike. They are physically different, and are affected in different ways by the same causes. So a bit of detective work is needed before embarking on a course of action or before drawing a final conclusion. But in the main, almost anyone can now assess the health of one's own stretch of beach. Dunes and beaches grow and shrink cyclically, depending on climate cycles and other cycles. Although the amount of sand in the dune/beach system can vary considerably, our health indicators remain valid whether the beach is growing or shrinking. Contrary to rocky and sandy cliffs that cannot repair themselves and therefore can only shrink, beaches can hold their own over many thousands of years. The picture shows a short-hand checklist which we will examine in detail below. no dry beach: The dry beach, the beach above spring high tide, extending to the fore dune is present only in very healthy beaches. Observe how much of it is present. The amount of dry beach is an indication of how much sand is freely moving along the beach. ripples in the sand: ripples tell you which way the sand is moving. Are they perpendicular (square) to the beach? In that case, the sand moves along the beach and not into the dunes. The wind may be blocked by a steep scarp or trees or houses. You may have to come back a few times because winds do change direction and change the lay of the ripples. Ripples are a health symptom, particularly when they run parallel with the beach. crusting of dried sand: Along the high tide line, particularly where the tide has been, the sand should have dried. Where it has not been crushed by visitors, check whether the sand has formed a hard crust. Crusted sand cannot be moved by the wind. It is a serious condition. top of wet beach not drying out: When the tide is half-way in, 9 hours after high tide, the top of the wet beach should have dried completely on a windy sunny day. Check how large the area is that has actually dried. You may return for another visual check and compare the beach with other beaches on the same day. In general, the top of the beach should dry, even during an overcast day. If it doesn't dry, the sand can't be moved. Look for green scum or foam, an indication of dense plankton blooms. Is the beach too flat for drying out? dirty looking sand: The sand needs to look clean, particularly when dried (except for our black iron sand beaches and grey beaches with rock sand). 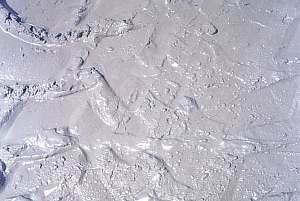 If it looks muddy, it is probably polluted by either mud or algae. Polluted sand won't dry well. Take a sample in an air-tight container like a photo film cartridge. Store it at room temperature for two weeks. If it stinks, the beach is heavily polluted organically by sewage, algae or bacteria. kick the sand or winnow it in the wind: If a dust cloud forms, the sand is severely polluted with silt and clay. hard sand: the beach, both dry and wet, should always feel soft to tread on. Only just above the tide line will the sand feel firm. Hard sand is an indication of pollution by mud. flat, wide beach: A flat, wide beach is a strong symptom that the beach is on its way out and perhaps impossible to salvage. Note that sheltered beaches are always flatter than exposed beaches. Beaches inside harbours fall a bit outside the scope of this analysis. A bit of knowledge of how the beach was some fifty years ago may back your observations. bared base rock: Some beaches drop off steeply into a current channel and their bases consist of hard rock. Only clean, coarse sand can be kept on these beaches by the motion of the waves. When the sand is polluted by fine particles, the beach lays flatter and loses its sand over the ledge into the currents. steep scarp in fore dune: A steep bank in the fore dune is a definite symptom of ill health. It shows that the sea is eating into the dune. Sand can not saltate up the bank. There is usually no dry beach and other symptoms are generally present too. no rolling dunes: Rolling dunes are characterised by a distinct low fore dune with hardly any vegetation and behind it a second dune with some vegetation, followed by one or more taller dunes. There is evidence of the fore dune shifting and new fore dunes being formed. These beaches are able to transport excess sand inland by means of their self repair mechanism. walls, reinforcements: Walls and reinforcements are a sure sign that property owners feel threatened. The shoreline must have been eroding recently. Listen to what the locals can tell about the beach. high buildings close to beach: Tall buildings or any obstruction close to the beach will influence the wind as far away as 30 times its height. Watch for erosion signs that occur near obstacles, compared to unaffected areas of the beach. shelter belt close to beach: Shelter belts have a major influence on the health of the beach. sand banks: Sand banks occur immediately past the low tide line and further out to sea. They can accommodate enormous quantities of sand. Wherever a sand bank occurs, it will hinder the waves and shelter the beach. As a result the beach lays flatter, which adversely affects its health. Sand banks are usually a sure indication that the beach is ill. Global warming, rising seas: As the sea water warms, it expands, raising the sea level by up to 50cm for each degree. As the polar ice caps melt, they release some of the 75m sea water still locked up there. It affects sick beaches but nor healthy ones. Beach high-rise: Not only beach hotels and apartments, but also shelter belts lift the sea wind up from the beach, thereby impairing its self repair mechanism. Most beach resorts suffer from this problem. Sewage: Sewage increases the bacterial activity in the sand. Bacteria glue the sand particles together and the sand dries more slowly or it crusts when dried. As a consequence, the sand grains cannot be blown in the sea wind. Dune planting: Dunes must move in order to preserve their shapes and to transport excess sand inland. They tolerate only sparse vegetation. When planted artificially, they lose their shapes, grow tall and lift the sea wind from the beach. The beach then dies, not able to repair itself. Beach dwellings: Beach dwellings, although lower than hotels, are placed close together and owners plant sheltering vegetation. The houses and trees lift the sea wind from the beach. Also the moving dunes are paved over and the sand can't move. Beach dwellers are highly motivated to stop sand from moving. Acid rain: The burning of fossil fuels brings the nutrients locked up in ancient organisms, into the air where it rains down as acid rain. It fertilises the land and can cause problems in enclosed waters (freshwater lakes). It also fertilises the dunes, encouraging dune vegetation, eventually leading to beaches eroding. See dune planting. Development: Present-day housing development involves extensive landscaping, the scraping and shifting of enormous quantities of soil. Much of this soil washes into the sea, polluting beaches. Soil erosion: Since native forests have been cleared and the soil is farmed, erosion has increased considerably. Nutrients, sand and fine particles are washed into the sea, polluting beaches and causing excessive plankton blooms that also pollute beaches. It slows the drying of the beach. Roading: Like developments mentioned above, motorways these days, require extensive shifting of soil, causing pollution of the sea. Roadside maintenance: The sides of all roads have been cut out of the land and expose the soil which washes into the sea. Although often revegetated, the maintenance process (mowing, spraying, etc.) is often too radical, resulting in erosion and pollution of our coastal waters. Farm runoff: Farm runoff (the storm water from farms) contains nutrients and soil. It causes the same problems as sewage and erosion do. Hydro lakes: Dams in rivers obstruct new sand from reaching the sea. Where beaches depend on a constant supply of new sand, this causes beaches to erode while otherwise healthy. Because soils world-wide erode much more rapidly today than in the past, more sand is reaching the coast than ever before and there appears to be an excess of sand in most coastal waters. Because the demise of our beaches is directly linked to human activity, today's problems are likely to accelerate in the future. The economies of societies expecting to become wealthier each year, grow annually between 3% and 6%. Growing at 3%, our problems will double in 25 years and quadruple in 50. Growing at 6% will quadruple our problems in 25 years and four times again in the next 25! Extrapolating this scenario implies that all our beaches will eventually die. Because the health of our beaches is so intricately entwined with everything we do, it seems almost impossible to salvage them. Is there anything we could do? When asked, people do like their beaches. 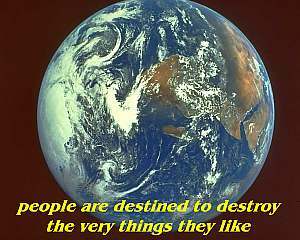 They are just not aware that their daily actions destroy the very things they like. Many of our actions do not only destroy beaches but also to a larger extent, our terrestrial and marine environments. Obviously, our societies will need to make major environmentally friendly adjustments. All over the world, environmental groups are championing this cause. It will take time and public education. But what could we do immediately? The following suggestions seem outrageous because they go against established beliefs and well intentioned effort. Remember that each beach has its own problems and remedies and that some beaches cannot be salvaged at all. Education: People are unaware of how they destroy the very things they like, including their beloved beaches. Extensive education is necessary, both at school and on television and radio and in newspapers. Tree cutting: Trees close to the beach are of major concern, particularly when they have been planted in closed ranks. Removing them would be a very easy and effective solution, saving beaches that would otherwise be healthy. As a rule, rows of trees should not be placed closer than 300m from the high water line. An individual tree here and there is of less concern because they would allow the wind to pass around them, not lifting it from the beach. Even shrubs closer than 100m from the high water line should be taken out or left in small groups. Driftwood: Driftwood has a beneficial influence on beach formation. It works like dune plants do, but in a zone which is out of reach of dune plants. 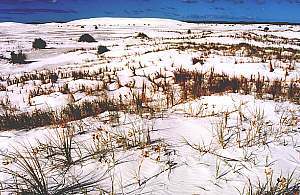 Unlike dune plants, driftwood will not prevent dunes from rolling inland. Driftwood should be left in place. Surf/life saving club houses: Club houses located near the water's edge should be moved backward and turned sideways to provide a smaller wind profile. They should be constructed in such a way as to be mobile and streamlined to not obstruct the wind. Likewise, observation platforms should be placed on a tall tower. Stop dune replanting: as has been shown extensively, dune planting has very serious long-term effects and should be halted immediately. Conservation groups and local bodies should be educated to redirect their effort and resources. Where the dunes have been planted, the vegetation should be removed or thinned (see burning). Wind blow-outs should be left undisturbed. Stabilisation of rear dunes should still be allowed. Remove exotic dune plants: Exotic dune plants have not evolved in our climate together with the living dune/beach system and behave in ways that cause damage. The introduced European marram grass (Ammophila arenaria) should be declared a noxious weed and removed from our country entirely. Bulldozing: In many places the dunes need to be reshaped for a wind profile that does not lift the wind from the beach and which has a low, unvegetated fore dune. Where a bank or scarp borders the beach, it should be bulldozed into a low, gently sloping fore dune. Fourwheel drive vehicles and bikes: have fun and at the same time save the beach by hooning over the first hundred metres of dunes and the entire beach above half tide. Vehicles can successfully destroy vegetation and scarps while at the same time streamlining the beach profile. They can crush the salt crusts on the upper beach. Sand mining: Accelerated erosion in the past century, together with reduced sand transport into the dunes, have accumulated too much sand in the sea. Where sand banks appear offshore, they should be mined for construction and roading. Tall dunes should be mined too, in order to reduce their height. Burning: By burning the dune vegetation, rather than bulldozing it under, nutrients and organic matter will be removed most effectively by evaporating into the atmosphere. Dunes close to the beach must have sparse vegetation and the slightest amount of fertiliser could make this impossible. Laws: Local and national laws should protect a wide beach zone from human development, for people's own sake and for creating natual wilderness. Dune parks: Over the years, people have been altering the dune environment so much that practically no wild dunes remain. By accident some beaches may have escaped human development. These are candidates for establishing pristine dune wilderness areas (dune reserves) which contain the dunes, a large part of the water catchment area behind it and a vast amount of sea in front. Action must be taken now to establish these parks before it is too late. Funds must be made available to buy back private property. Cost recovery: People like to live near the beach in a high risk area but are often not aware of danger. They rely on Governments to help out when disaster strikes. Consequently, coastal properties and living on the beach, have been overvalued. By zoning the whole coast into risk areas, potential buyers are made aware of potential risk. Home owners should privately insure their risk, rather than expecting help from the public purse. The cost of public remedial work such as building groynes and sea walls should be recovered entirely from property owners. Erosion control: There is no doubt that land erosion is still far too high, particularly in recently developed countries (like New Zealand). More awareness should be fostered and more effort spent on curbing erosion. Today, erosion is estimated 10-20 times of what was natural - clearly an unsustainable situation. Improved farming: Once the plough goes in, erosion accelerates many times. Many good practices are known to minimise the loss of land but also on pastoral land, farming practice can be improved considerably. Fertiliser subsidy: People who work with the land know that the best and most cost-efficient method of erosion control is fertilising. 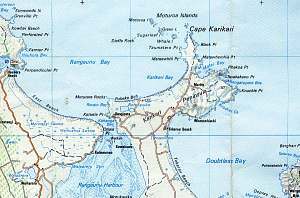 Yet here in New Zealand, the subsidy on fertiliser has been abolished in 1986, leading to accelerated erosion and problems in coastal seas in the nineties. Farmers now apply considerably less fertiliser than before 1986. Root systems and foliage are reducing, which accelerates erosion. By introducing a fertiliser subsidy for hill country, erosion is reduced considerably for very little effort and cost. Often the argument is voiced that the fertiliser will run off to the sea and cause more problems. But the first fertiliser components needed on land are lime (calcium), potassium, phosphate, sulphate and trace elements. All these components are already copiously available in the sea, and phosphates bind strongly to the soil's clays. Note that under no circumstance, fertiliser is be used on dunes. Sewage treatment: In many places, sewage runs off into the sea, particularly during rain storms. That causes problems but even properly treated sewage does. After treatment, the sewage has become ideally balanced fertiliser and when let loose in the sea, it fertilises the plant plankton which blooms excessively, causing problems to our seas and preventing beach sand from either drying or moving (crusting). Ironically, just past the continental shelf, there exists a shortage of nutrients and fish. By transporting our treated or untreated sewage that far into the sea, using tanker ships, we can turn a liability into an asset. It is a feasible and cost-effective alternative. Research: Many of the work and ideas presented in this section on beach erosion and its probable causes, need to be backed by solid scientific investigation. Funds should be made available to do so. The ideas in this section also require rigorous discussion. Using the information presented in this section Our disappearing beaches, everyone should be able to assess which beaches are worth saving and which ones can best be left alone. You will be able to determine when a sea wall is the only remaining solution left. It would of course be impossible to do a review for the whole of New Zealand here, let alone one for the entire world. 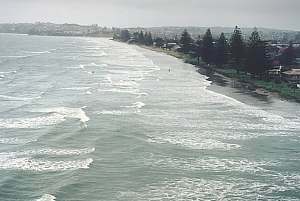 Let's start with a popular beach which is beyond rescue, Orewa Beach, just north of Auckland, New Zealand. Houses and trees are too close to the water's edge, the beach lies flat for many hundreds of metres, soil erosion is vast, sewage from the population of 30,000 is released nearby, the beach sand is polluted and the sea has progressed too far. For Orewa the only protection remaining is a sea wall. This sea wall could be constructed anywhere up to 500m in the sea, reclaiming land for a buffer zone, but it would diminish the value of local property if what remains of the beach is moved further away. 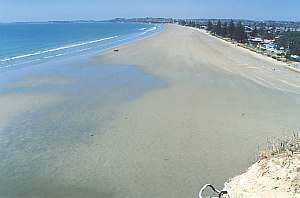 Note that Orewa beach may well be a good candidate for beach dewatering applied in several stages. 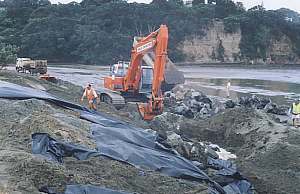 Dewatering allows the sand to dry and blow towards the present wall, creating a dry beach zone. The amount of sand can be controlled by turning the pumps on or off, such that the right amount of mobile sand is created, not to blow onto properties and roads. During storms the dry beach will disappear but it will rebuild rapidly due to dewatering. Orewa Beach at low tide during very calm weather, shows how flat this beach is. The sand can no longer dry. Houses encroach right to the water's edge. There are rows of tall trees and tall buildings. It would economically not be possible to restore the sea wind but dewatering is an option. Orewa Beach just before low tide during rough weather, shows how far the shallow sand and sand banks extend into the sea (about 500m from the high tide line). It is where all the sand of the beach and all renourishment efforts, have gone. 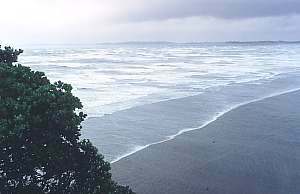 Orewa Beach during high tide shows the water lapping at the boundary of private properties. Along most of the water front, the local council has erected sea walls. After breakers have crossed the vast stretch of flat sand, they have lost nearly all their energy. It makes people believe they are safe here, but they are not protected against storm surges. The beach sand of Orewa Beach looks polluted by fine particles (silt and clay) and it never dries. Erosion from urban development and roading and sewage from the local sewage treatment plants, end up in the sea. 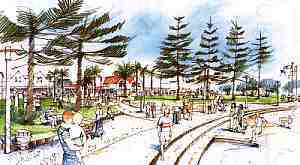 A drawing from recent plans for renovating Orewa's beach centre. The three steps in the foreground are the only barrier between the city and the sea. At the other end of town, engineers are constructing a sea wall with entirely different proportions (see right). The coastal area has not been zoned by hazard rating. Property owners do not know the risk of living or building here. After winter storms in Nov 1998 had carved some foreshore away, it was decided to construct a sea wall there. The design involved a ditch of about 1m in the beach sand from which a plastic, permeable cloth (geotextile) slopes up the shore. The whole is covered in large boulders. The cloth is supposed to hold back the sand while letting ground water and storm water through. Otama Beach on the Coromandel Peninsula, New Zealand, is an example of a pristine pocket beach that somehow has escaped development. It is backed by a wetland reserve and is a prime candidate for a pristine dune wilderness area, fronted by a large marine reserve. 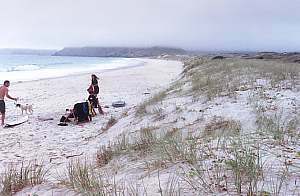 Otama Beach is a pocket beach strung between headlands, facing north. It is very exposed. The peninsula is sparsely populated and produces relatively little run-off. The waters are clear most of the year. The beach is backed by a wetland nature reserve and the Otama River has a small catchment area. The beach reserve should enclose the entire catchment area and ocean extending to 40m deep. Otama Beach has all the symptoms of a healthy beach: glistening clear quartz sand that squeaks when walked on , a gently sloping fore dune which is sparsely vegetated by the native spinifex dune grass (Spinifex hirsutus), while mid and rear dunes are low in profile. There are no houses. In the northern part of the North Island, New Zealand, I have earmarked a number of beaches that are worth saving first. The accompanying map shows where they are. Each beach is worth saving for a different reason. It is of course impossible to be complete but everyone knows a beach in his/her locality that is worth saving first. From the Otama Beach example and the examples below, a number of reasons and conditions become evident. By focussing effort on those beaches that are still in a salvageable or even healthy state, quick progress can be made, while the result is also likely to remain successful. Parengarenga spit: The Parengarenga sand spit consists of almost pure, extremely white looking, quartz sand. The sand is mined for glass making. The spit is very sparsely vegetated and has no tall dunes. The Parengarenga harbour is sparsely populated and it is a traditional homeland for the native Maori people. It is a unique place. The sand spit, harbour entrance, sea and part of the estuary could be made into a beach/marine reserve yielding many benefits. But the area is under threat of dense plankton blooms and siltation from recent agricultural developments. Even the polluted water from Auckland's west coast arrives here. The water, only ten years ago (1990), praised for its clarity, has recently become very turbid. Sea life in the harbour has been decimated. Karikari Bay: Facing north on the Karikari Peninsula is Karikari Bay (Puheke Beach), strung between three headlands. It is a pristine area with clear water and clear sand, but dune revegetation has formed a steep bank on its fore dunes. It can be salvaged easily and turned into a dune/beach/marine reserve. 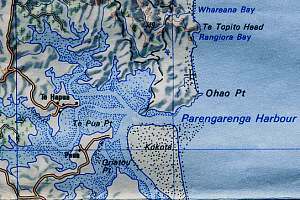 Part of the adjoining unique Rangaunu Harbour and the exposed rocky shore to the East, with some offshore islands, could be included. Hokianga dunes: Most visitors visiting Northland, come past the Hokianga Harbour where they marvel at the tall sand dunes marking its entrance. The dunes are unique and wild and bare and very sparsely vegetated. They are worth preserving as a unique wilderness habitat. But they are threatened by planted pine forests on the rear of the dune and wilding pines (wild pine seedlings) from these forests. They can still be saved and turned into a pristine wilderness area. Due to pollution, the dunes are no longer replenished to keep up with natural erosion. Ocean Beach: Ocean Beach is found on the Bream Head peninsula, east of the township of Whangarei (population 40,000). It can be reached easily. Ocean Beach faces north and is very exposed. Its steeply sloping beach consists of clean sand and it is backed by gently sloping fore dunes and low profile rear dunes. But it is under threat from dune planting. 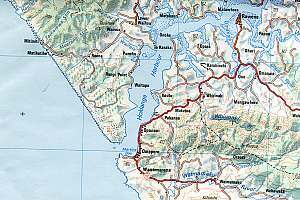 It is an excellent candidate for encompassing the entire, uninhabited peninsula, mountains, beach, dunes, sea, exposed rocky shore and part of the entrance to the Whangarei Harbour, into a pristine wilderness area. Because the peninsula can be isolated from noxious animals such as possum, wild cat, rat and stoat, the peninsula can be made to act like a 'mainland island'. Mangawhai spit and dunes: The Mangawhai spit is an uninhabited overwash area (the sea washing over it during large storms), with low dunes. It has a large wild, bare dune to its south and is flanked by a small estuary to the west. Its entrance is plagued by drifting sand banks that are presently being mined for sand. It is a place to save for posterity. But the dunes are threatened by revegetation and a planted pine forest. The river's catchment area is prone to erosion. The Parengarenga sandspit (Kokota) must be preserved as a dune/beach reserve. Parengarenga Harbour is the northernmost harbour in NZ. Its sand spit consists of almost pure quartz sand. It is sparsely vegetated and its sand can wander freely. 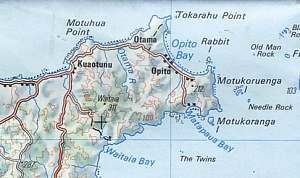 Location of Puheke Beach and Karikari Bay on the Karikari Peninsula. Bottom centre is the Rangaunu Harbour. 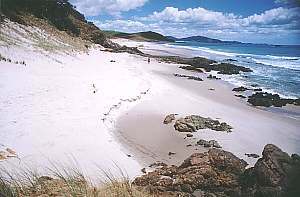 Puheke Beach showing dunes and vegetation. In the top right corner Mt. Camel, guarding the entrance to Houhora Harbour. The tall Hokianga Harbour dunes on its northern spit have been planted estensively in pine forests. 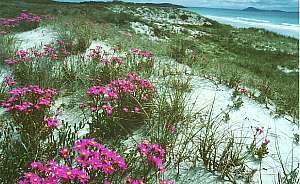 The wild bare dune is worth saving as a dune/beach reserve. 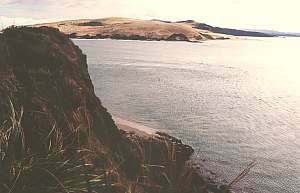 The Hokianga Harbour with its entrance on left behind the rocky promontory. The unique wild and tall sand dunes are threatened by pine plantations in the far distance and they are shrinking. 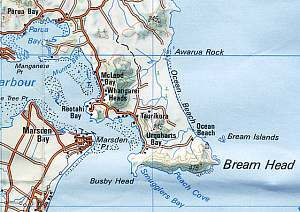 Ocean Beach is found on the ocean side of Bream Head, a sparsely populated peninsula. A dune/beach protection reserve could be combined with a marine reserve rounding Bream Head and extending into the harbour entrance. Ocean Beach extends from an easily accessible bay (behind us) past an inconvenient headland, into the far distance. On left a tall rock face but in the distance low profiled dunes and a steep beach with clean sand.